I was going to wipe off the counters and take some pictures for a look-at-how-far-we’ve-come kitchen project update. Instead, there was an unfortunate food incident and the remodeling tales will wait a bit longer! With a short window of time to make lunch between an appointment and piano lessons today, I threw a spaghetti squash in the microwave without poking the flesh to release steam while it cooked. The entire squash exploded when I cut it open afterwards and now I have mild burns all over my face, neck, arms and hands. Since my right eyebrow got the worst of the heat, I’m guessing I’d be in the emergency room if I hadn’t been wearing glasses to catch the stuff headed for my eyes! I’m following my doctor’s orders for treatment and I should heal quickly without permanent damage since it’s more like a blazing sunburn than the “hot curling iron” feel. 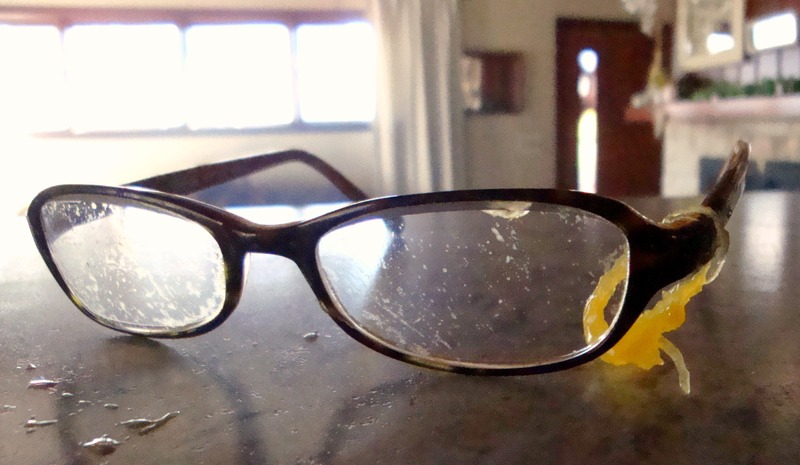 But it’s a little haunting to think – what if I hadn’t come back into the house for my glasses before that appointment this morning? Since the kitchen is still carpeted, I’m toying with the idea of ripping it up and going down to the subfloor instead of cleaning the edible war zone. I even found a chunk of squash that flew over the island and into the back hallway. I suppose we should really think about getting a dog for these heavy-duty jobs. And I’ll walk with grace my feet and faith my eyes. Oh man!! What a story! !